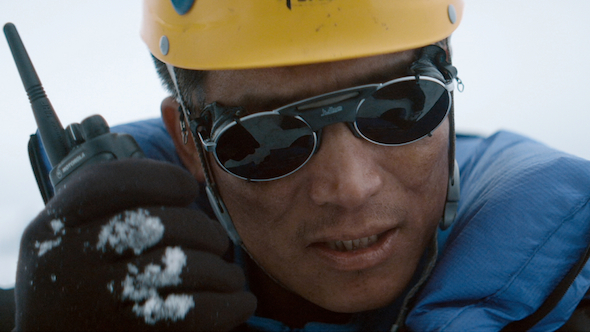 THE SUMMIT is Nick Ryan's documentary about the 2008 K2 disaster. K2 may be less tall than Everest, but it is a far more challenging climb. The peak is in the "death zone" where the human body cannot naturally survive - where the altitude, lack of oxygen and fatigue severely impair normal mental and physical function. Of the limited group that successfully ascend K2, 1 in 4 will not survive the descent, with a particularly high fatality rate around the "bottleneck" - a small pass to the upper slopes with an overhanging ice Seroc waiting to break off and cause chaos. The 2008 disaster saw a number of international teams and some solo climbers all try to ascend at the very end of the climbing season. Despite poor planning and execution, crossed wires and some inexperience, 22 people did make it to the summit, but 11 lost their lives coming down, making it the worst single day on K2 in history. What this documentary does well is to use video and photos and interviews with survivors and close family to give us a feel for the personalities of the men and women on the slope, what drove them on, and what might have been their reactions to the extreme conditions. We become attached to them and will them to survive, even though we can deduce from who and who isn't a talking head, who will fall victim to K2. We also become acutely aware that all eye-witness testimony is suspect and all moral judgements futile, because of the very nature of altitude sickness. There's an extent to which we will never know what really happened up there that day. What I found frustrating, however, was the rather haphazard organisation of the material, rather than a more straightforward linear approach. It was only upon returning home and going onto the internet that I got a really clear picture of what went on and the controversies around the different accounts - and that can't be right can it? I also felt that because of who would and wouldn't speak to the director, the movie might've been a bit uneven in its approach. Here and there throughout the film, different participants make comments about the Koreans being ill-prepared, just sitting and smoking, treating the sherpas poorly. This is put in stark contrast with the undoubtedly deeply brave and impressive Pemba Gyalje, who survived, and the charismatic Irish climber Ger McDonnell, who tragically died, apparently trying to save South Korean climbers. I was crying out for someone to interview someone from the Korean team to get their perspective. To be fair, in the end credits there is a statement saying that the surviving Korean team leader refused to be interviewed. But couldn't they have gotten someone, anyone, a mountaineering expert, to explain the Korean perspective? Overall all then, a fascinating documentary. It was my sixth straight film of the day, and I have no interest in mountaineering, but I was transfixed by the story. I am thankful for the insightful interviews with key survivors and their family, and Nick Murphy and DP StephenO'Reilly's breathtaking K2 footage. But it felt like only half the story had been told. THE SUMMIT played London 2012. It does not yet have a commercial release date. The running time is 95 minutes. Hi there, Thanks for your review just wanted to mention it was Director Nick Ryan & Cinematographer Stephen O'Reilly who shot the K2 Aerial Footage in The Summit. Hi Niall, thanks for the info - review duly amended. So which bits did Robbie Ryan shoot - the talking heads? Might be worth getting the team to update the IMDBPro page.